How does the TVPage service interact with my online store? This discusses specifically how data is exchanged and how the TVPage service is deployed into an existing infrastructure. A product feed is made available to TVPage (FTP/SFTP/HTTPS). We receive and ingest this on a scheduled basis. It can be placed on an FTP/SFTP site, provided by TVPage or can be made available to TVPage for ingest via HTTPS. A conversion pixel is installed on the order confirmation page of your store. When this pixel fires, it sends the order details (SKU, Quantity, Price) to our system for conversion and revenue reporting. No personally identifiable information is sent. 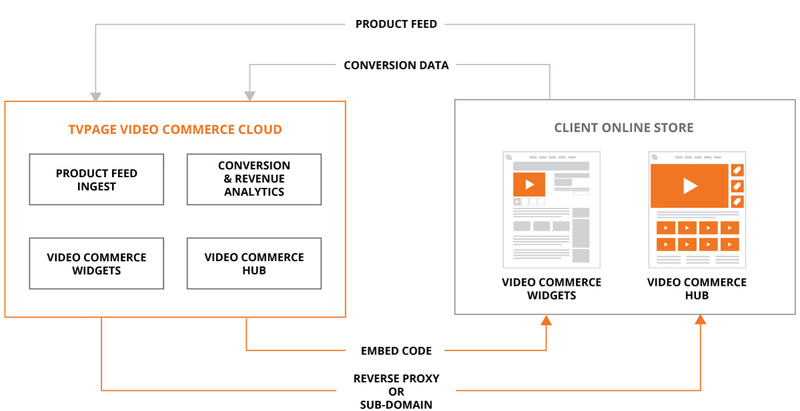 A TVPage video commerce hub is deployed to a sub-folder using a reverse-proxy configuration at the CDN layer. For example, this means that requests to www.domain.com/videos/* would be routed to TVPage and we would return the entire page contents to the requestor. Alternatively, a video commerce hub can be hosted on a sub-domain, which only involves a DNS level configuration to point the sub-domain, for example video.domain.com to the TVPage service.